Franz Jagerstatter was born in Austria near Salzburg. His father and mother were not married when he was conceived and his father left shortly after Franz's mother, Rosalia Huber, discovered that she was pregnant. Franz was raised, at first, by his mother and his grandmother--Elisabeth Huber. Though his father--Franz Bachmeier--was not quite the strong father figure Franz might have hoped for,it was impacting and painful when Franz Sr. died in World War I. Franz's mother would, eventually, marry Heinrich Jagerstatter and Franz would take his new father's surname as his own. He lived a fairly typical life for an Austrian peasant in the early to mid 20th century. There were particular indicators of any religious or spiritual life of note. Like his father, he had a child with a woman outside of marriage.Eventually, he settled down and married a local woman by the name of Franziska Schwaninger. They would go on to have three children of their own. In many ways, this story could be the story of countless others if we stopped right here. But, Franziska had an interesting effect on Franz. Her quiet and confident faith kindled, anew, the embers of Franz's faith buried deep within him.They honeymooned in Rome. Spiritual experiences there coupled with Franziska's steady compassion for her new husband resulted in renewed dedication of Franz to his faith and the Church. He, soon, found himself serving as sexton of a local parish when he wasn't busy providing for his family in the fields. Shortly thereafter, the Nazis annexed Austria. When talk began of the annexation, Franz was a vocal opponent of the Nazi regime and philosophy. To anyone willing to listen he described the Nazi regime as a train "going to hell." He begged his friends and families to understand that cooperation with this evil was unacceptable. And, yet, annexation continued. The Nazis offered sums of cash to the Austrian people in an attempt to raise morale and public feelings about the annexation and Franz refused to accept the money offered to him and his poor family.Terrible hail storms destroyed many of Franz's much needed crops and, yet, he refused the emergency subsidies offered to him by the Nazi regime. 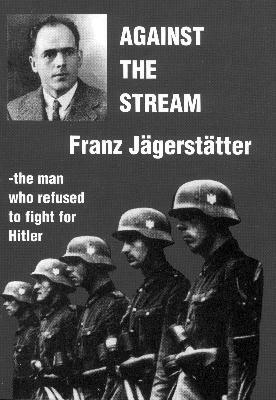 Franz exhibited startling clarity of mind by refusing and rejecting the opportunities to cooperate with the Nazis when it would have, perhaps, benefited him in the short-term. Instead, he chose to be an example of non-cooperation with evil. He labeled their subsidies and gifts a "crooked game" and said: "I cannot play the game. The game is a lie." Eventually, the second phase of the game fell into place and the men of Austria were called to serve in the military of the Third Reich. He was drafted but vowed disobedience to the Empire. He was advised by friends, family, and ministers to serve in the military because he was a husband and father. They assured him that it would be okay because they didn't think you could really blame a soldier but, rather, that you should blame the officer for the commands.This rationalization did not, ultimately, convince Franz. Instead, he refused military service and told his friends and family: "I believe God asks me to live by my conscience." He refused service and the Empire threatened death in retaliation. If he would not lay down his life for the aims of the Empire, then the Empire would seize his life and break it.Ultimately, Franz refused to play their game and was beheaded as a traitor to the Third Reich. Franz would confide to a priest shortly before his execution that he knew that his one small death would not stop the Imperial war machine. Rather, he understood his death--his martyrdom--as "a sign that not everyone let themselves be carried away with the tide." Franz did not, in fact, get carried away with the deceptive and destructive tide of the Third Reich. Refusing to lay down his life in cooperation with the Empire, he sacrificed it in front of them and testified to a powerful faith that refused violence and powers even when they came with a strong rationalization or the illusion of benevolence.